Mega Sale! Save 29% on the Enesco Jim Shore Gracious is Giving Golden Garland Santa Christmas Figurine 4058759 New by Enesco at Two Clock. MPN: 4058759. Hurry! Limited time offer. Offer valid only while supplies last. . Gracious is Giving. 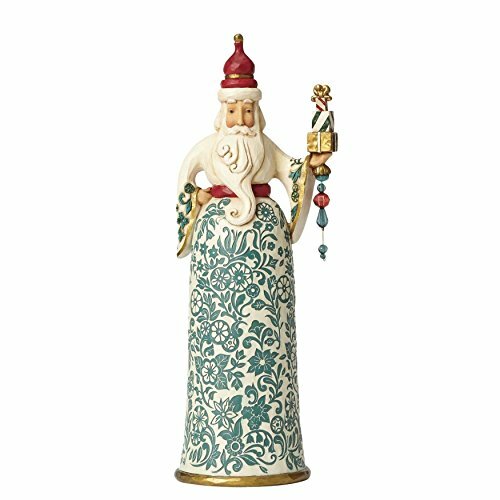 Golden Garland Santa with Gifts Figurine. Part of the Heartwood Creek collection by Jim Shore. Made from stone resin.
. Gracious is Giving. Golden Garland Santa with Gifts Figurine. Part of the Heartwood Creek collection by Jim Shore. Made from stone resin. Approximately 10.75 inches tall (27cm). Includes original manufacturers box and packaging. Made by Enesco. Festive with a touch of timeless elegance, the Golden Garland Santa features intricate floral designs and burnished metallic detail. With a hand on the hip, he proudly holds up a stack of stylish gifts.